The Charles Augustus Peabody estate designed by Grosvenor Atterbury between 1910-1912 in Cold Spring Harbor. Peabody, an attorney and partner in the firm of Peabody, Baker & Peabody, was president of the Mutual Life Insurance Co. His son Julian Peabody resided at 'Pond Hollow Farm' in Old Westbury and was a partner in the architecture firm of Peabody, Wilson & Brown. 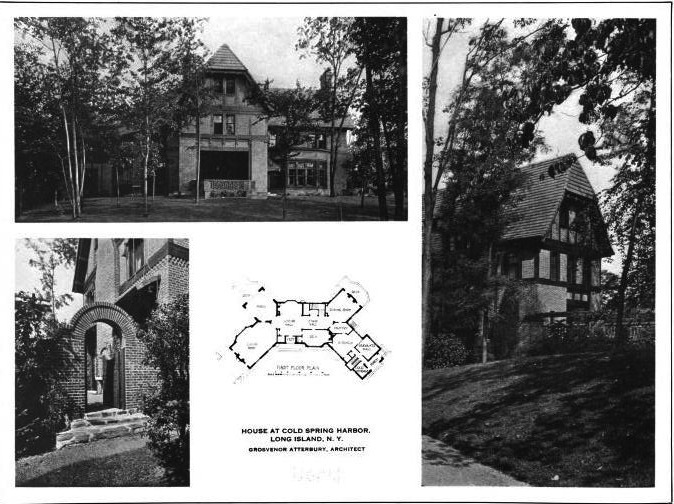 The residence suffered a fire and was demolished c. 1978. Click HERE to see the Peabody estate intact in a 1953 aerial. of course they tore it down. its design is far too unique and interesting and it has way too many unusual elelments like that little arch and all those different dormers. security def - "iBusho" - a recent statement by a former head of state showing his command of the language hasn't deteriorated since he was in office. Wonderful building---one's own private Forest Hills Gardens, as it were. 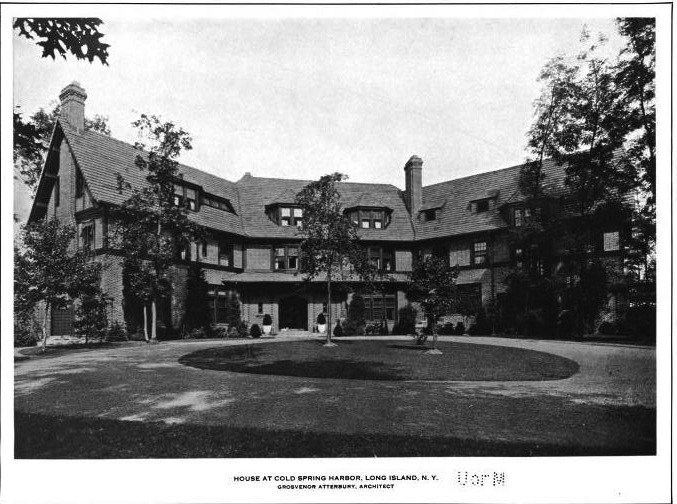 But it raises the obvious question: Why does one suppose that Peabody went to Atterbury and not his own son, in the time-honored tradition of architect's parents throughout history, to design this house? If I may venture a guess... I believe Pond Hollow Farm, Julian Peabody's house, was PWB's first major commission. The firm didn't really get off the ground until 1911 and this one was 1910. My guess is as much as C.A. loved Julian he didn't want his new house to be some sort of experiment simply to give his son a commission. Do we know where in CSH this was located? Such a waste -- a picturesque & livable design. The site was roughly East and South of Uplands Farm Sanctuary Nature Conservancy. Lawrence Hill, Saw Mill, and Peabody Roads were approximate perimeters. A few indirect relatives of his live in the general area. A damn fine work but a highly under appreciated but tremendously talented architect. He was one of a relative small clutch of architects who truly brought out some sensation labor from his contractors. The level of detail that exists with texture is wonderful to this day. As noted by so many others the shame here is that the house was livable for today's baron wannabe. Even in the energy crisis 1970's the house likely was perfectly fine to heat/cool and still spoke volumes to the owner's status and good taste even if they did nothing more than buy it for a song. Was this home demolished or did it not suffer a serious fire and was torn down soon afterward? The carriage house still exists on Saw Mill Lane as well as the small pergola enclosed garden shown in the third B&W photo which is now located off to the side of a newer home built on Saw Mill Lane. I believe the Atterbury home was demolished after the devastating fire in the 70's. If the house stood into the 70,s then its well hidden. The distinctive footprint can't be found in the 1953 or 1966 overhead. LOL, HH anon is correct. The house was located closer to the harbor. The entrance drive was off of Harbor Road and the brick gate posts are still there. Follow a long winding drive up the hill and the X layout of the house is clearly visible. I remember that fire, it was a prominent story back then. So it wasnt demolished intentionally but severely damaged in a fire. The carriage house is on Saw Mill Lane and is quite beautiful. All brick and timbers. Anon is correct about the house, the fire and where it stood. Someone needs to update the wikimapia site! According to the 1917 map Saw Mill used to run all the way through to Harbor Road...though it appears it was a private thoroughfare. What a wonderful architect with a very distinctive style and special use of materials. The siting of the house must have been impressive with a great views of the harbor and sunsets! I found this thread of comments very interesting. I am blessed to be able to live in the Carriage House with my family. When we moved in 10 years ago, it was in a state of disrepair, and my husband and father-in-law, both talented architectural designers, worked hard over several years to restore it and rennovate it, doing much of the work themselves. My mother-in-law, who is a talented artist and gardener created the beautiful rose garden now behind our home. 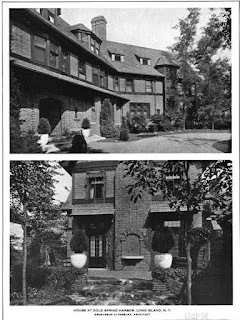 I believe they all succeeded in modernizing our home while maintaining the beautiful original architecture of the Peabody estate. This property's beauty knows no bounds. It is a sanctuary nestled back off of beautiful Saw Mill Lane. Surrounded by only the sounds of nature and the beauty of the bountiful and ever changing sunsets, it is a rare gem with a true resort like atmosphere. I just found this story. I grew up in the Carriage House from 1975 to 2002. Hardly in "disrepair" it had charm and character of an old home. We sold it to a wonderful family who only owned it for a year or so and then it was empty for a period of time. I watched the above mentioned renovations from a distance, and was saddened by them. Walls were smashed out and the home became contemporary in appearance with lots of white paint and glass. The steam heat was ripped out and replaced with forced air. The garage became a glass fronted home theatre, and the carved wood fireplace mantel was slathered in paint. An interesting note is that the fireplace mantel was rescued from after the fire in the main house. We had it professionally restored and finished in proper stain. A beautiful carved piece that was imported from England when the main house was built. We enjoyed growing up on sixty acres - what a treat! Because we met the caretakers from the original estate (name was Katnack) we were given some photos and I still have the original framed drawing on what appears to be cloth showing the estate layout and piping and drainage. I also have some roof tiles, a few Edison bulbs, pushbutton switches, and some glass cabinet doors from the original construction. We bought the house from the developer who had put up some nice houses on the property....in the late seventies. The house was magnificent. There was a Jesuit order living in the house when we looked at it.On the day of our closing the road builder of the development, Repetti, over-bid us and stole our dream home. It came to pass that Repetti lived in the house with a woman, not his wife, and they had about 12 or 13 children between them. They were having financial trouble. One night when the parents and children where not home the place mysteriously burned down. The fire inspection believed it was arson in order to collect insurance. The insurance company brought in heavy equipment to raise the iron beams in order to get to where they believed the fire was set in the basement. I don't know if the claim was paid or not. It was heart breaking to lose such a historical and beautiful home to greed. I'd like to clarify a few items from the above post. My father Robert Repetti did indeed by the home and I do know that the Dimitri family was also interested in buying the house. It would appear that the seller was accepting multiple bids and the highest bid won. Their family and ours both set forward in rehabilitating the homes our the main home and theirs the carriage house. My father wasn't a road builder (though he brought his equipment out numerous times to grade the road prior to the developer paving it) but owned a construction company in New York City that mobilized his crews for months renovating the neglected main home. 42 rooms of wood floors, 13 fireplaces, ancient electrical, plumbing and boiler fired radiator heating system, crumbling plaster, hand hewn doors and ornate trim - all of this painstakingly brought back to period accuracy. Fortunately, the barrel tile roof and copper gutters were rock solid and leak proof. In the winters, the house was a challenge to heat due to a complete lack of insulation and individual pane leaded glass double hung windows, using 500 gallons of heating oil every three weeks. One of the more remarkable aspects of this estate was outside the home in the gardens, lush with azalea and rhododendron in the spring, beautiful lawns, an Olympic sized swimming pool and clay tennis courts overlooking Cold Spring Harbor. The front elevations show a couple small trees but was actually a very large tree (I believe they called it a copper beech) centered in the circular drive. Surrounding the property was conservation land that rolled downhill toward the harbor. The original columns for the gates (Rt 231?) are visible using google maps street view, but the drive was not utilized as the developer that bought the estate did not want to maintain it and it did not fit into his subdivision plan. My parents divorced prior to my father buying this home and moved in with his fiancé, who he married in June of 1976 at an outdoor wedding at the house complete with horse drawn carriages, strolling violins as part of a lavish affair that would have been fitting of an event a century ago. They had two children of their own and there were five of us from his original marriage, though the youngest two lived with their mother, not quire 12 or 13. There were indeed two fires, the first on a cold December evening in the kitchen where the housekeeper was attempting to melt a tin of floor wax directly on a stove top that didn't end well, though largely contained in the kitchen. The second occurred while we were on vacation and in an age without email and cell phones, returned to find the smoldering remains, with twisted steel beams and standing chimneys along with a portion of the left wing standing. My father brought in heavy equipment from his business to remove the steel beams and remove several tons of coal that smoldered in the basement so that the fire department could finally extinguish the fire. The Fire Marshall determined that there were no accelerants and ruled that it was likely an electrical fire of unknown origin. Our family spent a couple years waiting on the insurance company to finally settle the case during which time my father was diagnosed with lung cancer and died in the summer of 1978. His widow was not interested in rebuilding and the property was sold. The Dimitri's did an amazing job renovating what was a carriage house with servants quarters flanking the main garages into an inviting home that was also fitting of the original design. It saddens me to hear that it fell into disrepair and then the original finishes were painted over. Their courtyard was surrounded by a beautiful brick wall that I do remember well. Years ago I tried to find the original plans, but the CSH building department said they were gone long ago. Seeing the pictures here brings back a flood of memories of my youth but sadly, the home like so many treasures from the past, are gone. grew up in the house, and we (her family) grew up next door in 1950-1980's.I visited the house and grounds almost daily on my bike. mother to see all the changes,and after it was developed we seldom walked that direction though the grounds were lovely and vast. 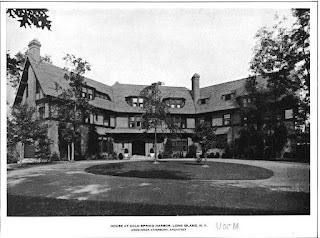 a place I frequented because the Irish cook, Mary Watts, and the gardener,Frank Watts lived there in the old quarters. Mary always had a cookie for visitors, and Frank gave me my own plot in the garden for a few years to grow corn and cherry tomatoes for our summer table. little paths in the woods.